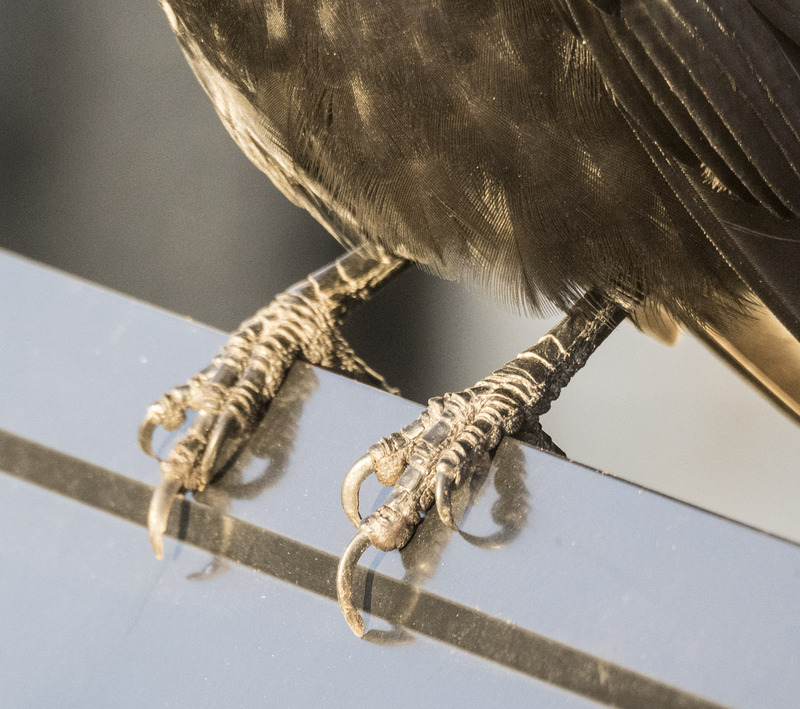 If you’ve been wondering where Eric the crow is these days, read on. After a rather long day in the studio I was faced with the choice of a “feet up with tea” break, or a short walk. Luckily the sunshine outside persuaded me to go for the latter. I do love autumn. The special light, the sharpness in the air, the colours. All were on offer for my half hour walk. I set out in the direction of Notre Dame School at the end of our street and to my delight, as soon as I reached the corner, there was my old buddy, Eric. He used to be in my garden all the time last winter, but he moved his family over to the school, with it’s stand of tall Lombardy poplars, for the nesting season. Since then, my garden has been “claimed” by Vera and Hank who tried and failed to raise a family in the big tree just across the alley. They vanished some time over the summer to be replaced by George and his family, which includes an ailing baby crow. 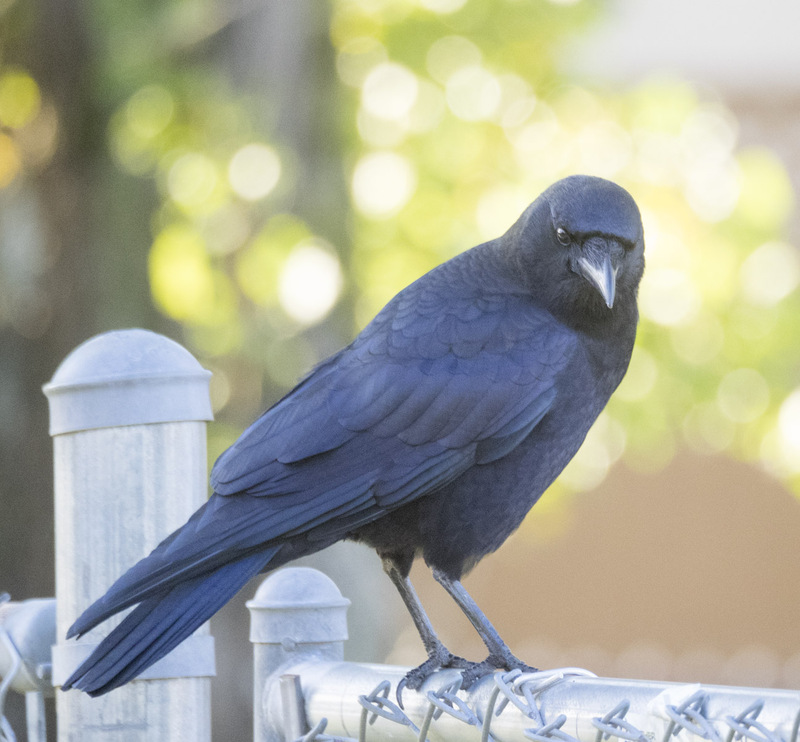 Recently there’s been a bit of a territorial conflict with George defending “his” space from other crows — which may include Eric. It’s hard to tell who’s who when they’re swirling about in the air. Much as I’d love to have Eric back in the garden, I pretty much have to leave it to the crows to sort out their own pecking order. However, I do try to visit the school corner once a week or so to check in and see if Eric is still there and looking well. And, I am happy to report, he is. After a short chat with Eric (crazy crow lady alert!) and the donation of a couple of peanuts I found in the seams of my pocket, I walked south a bit and then west along Charles Street. As you may know, I have a bit of a hydrangea obsession — particularly at this time of year when they are a bit faded, but displaying gorgeous moody and subtle shades. 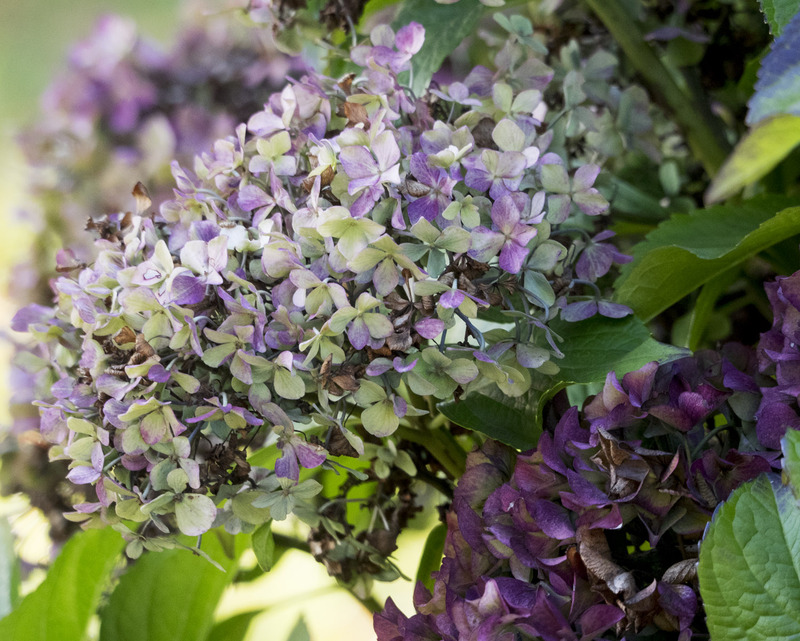 Yet another version of hydrangea’s autumn colour palette. 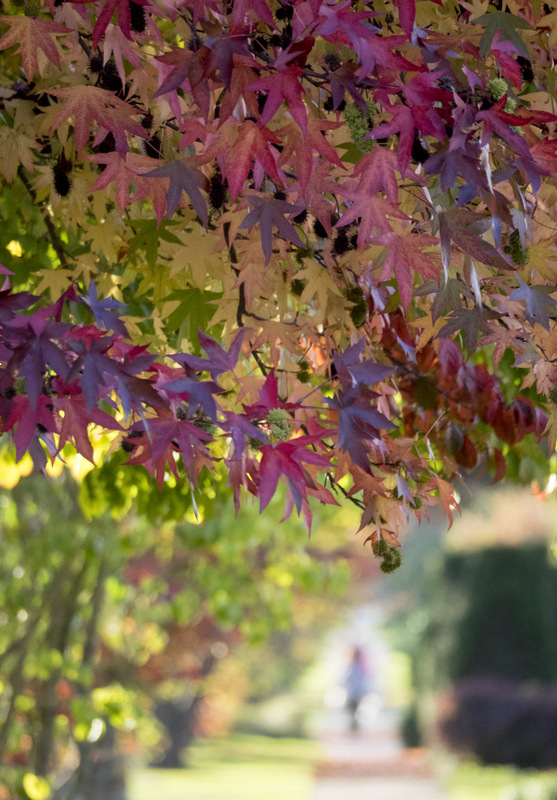 The long view down Charles Street, with the sun behind the maple and dogwood trees created an explosion of autumn colour. 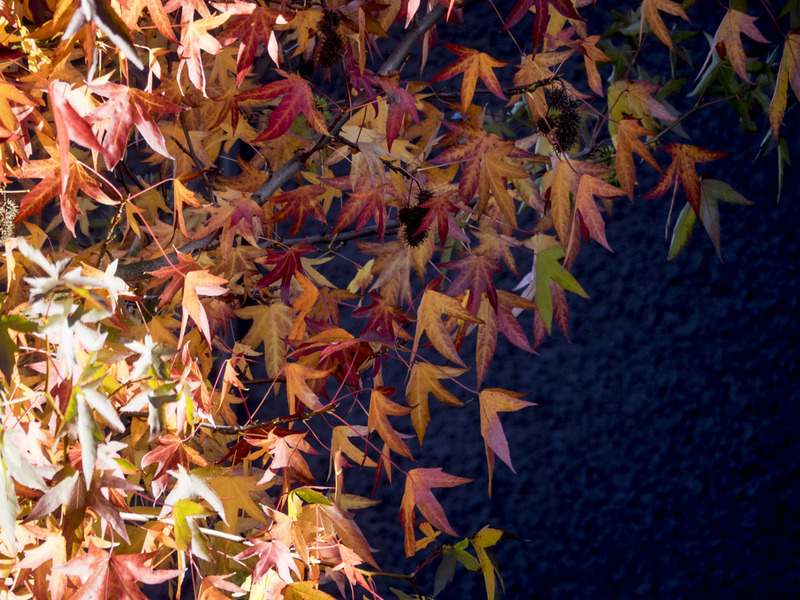 Maple leaves with pedestrian in early evening light. 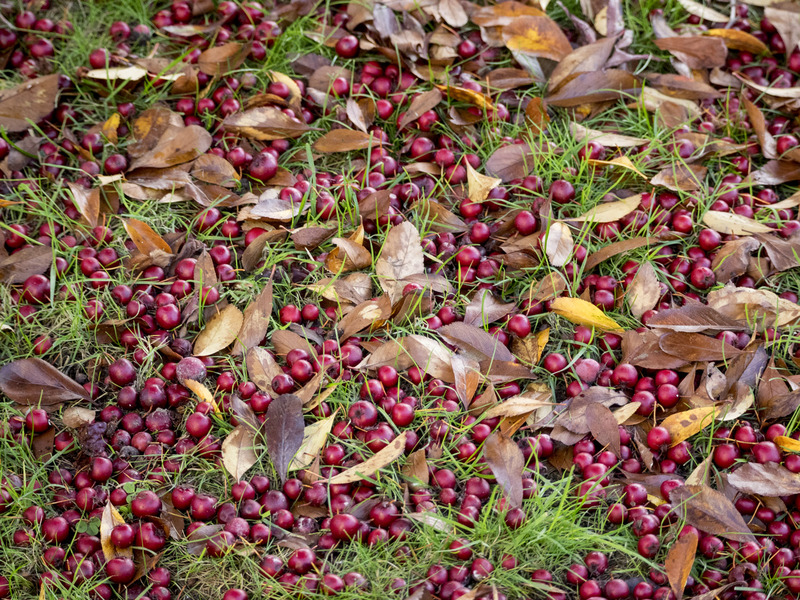 A bonanza of fallen berries on Penticton Street. When we had two Labs we had to avoid this street in fall, because they’d just stop to feast. With disastrous results later … Those berries always remind me of Molly and Taz. 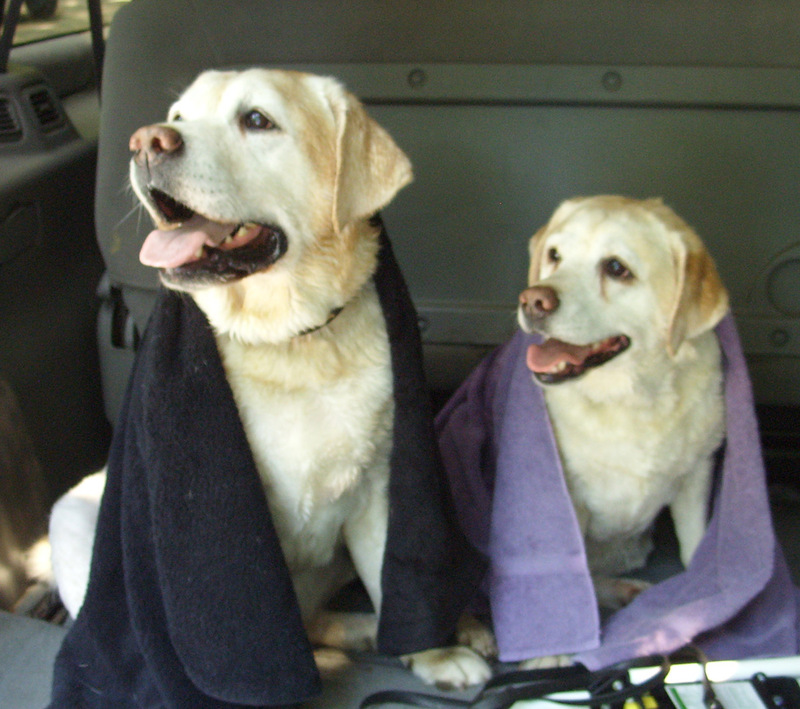 Post-swim Taz and Molly. Miss those dogs! Finally, it was time to head home. At the corner of Parker and Slocan, I was greeted by George. I knew it was him at once because of (a) the meaningful look and (b) the sick baby crow he was with. George was surprised to see me out of my usual garden setting, but immediately recognized me. George’s magnificent armour plated feet reflected on a shiny fence. George followed me the block home. We walked (well, he flew) down the alley. 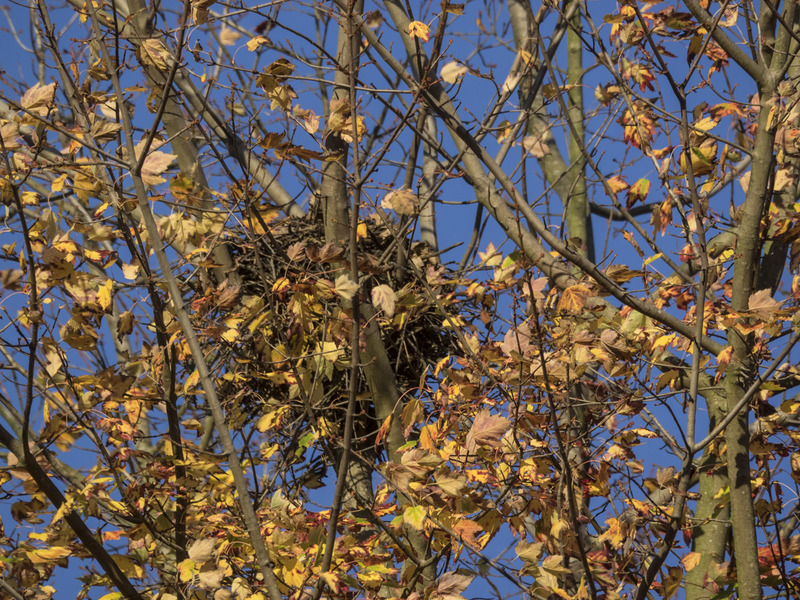 Now that the leaves are mostly fallen, you can see the nest where Hank and Vera tried their hand/claws at raising a family in the spring. Hopefully they’ll succeed next year after this spring’s practice run. 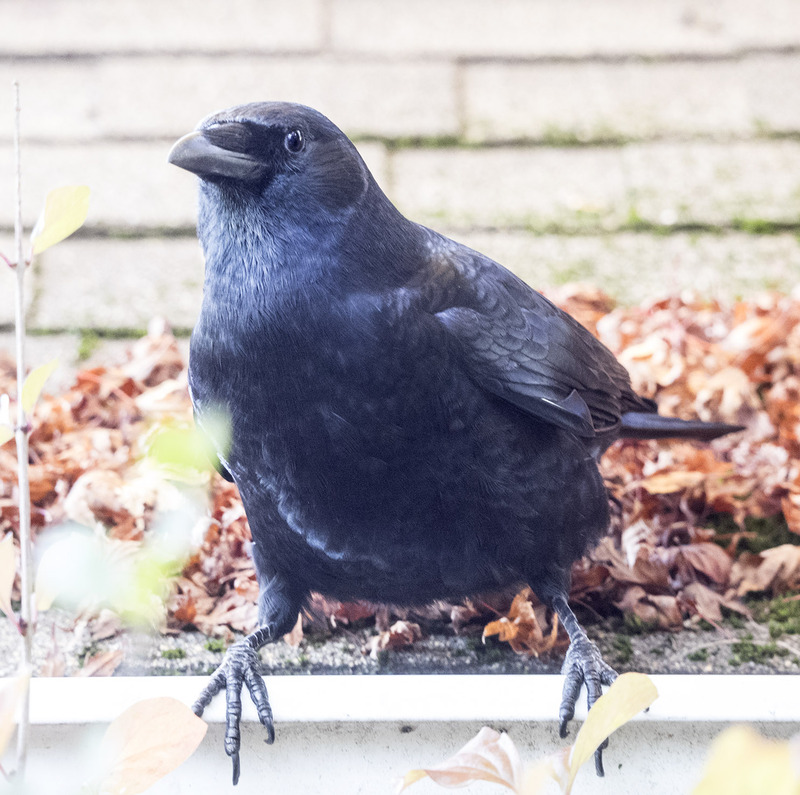 Back at the garden, George settles himself on the studio roof, waiting for a few peanuts. I only had half an hour “off”, but I felt as if I’d been on a proper little mini-vacation! 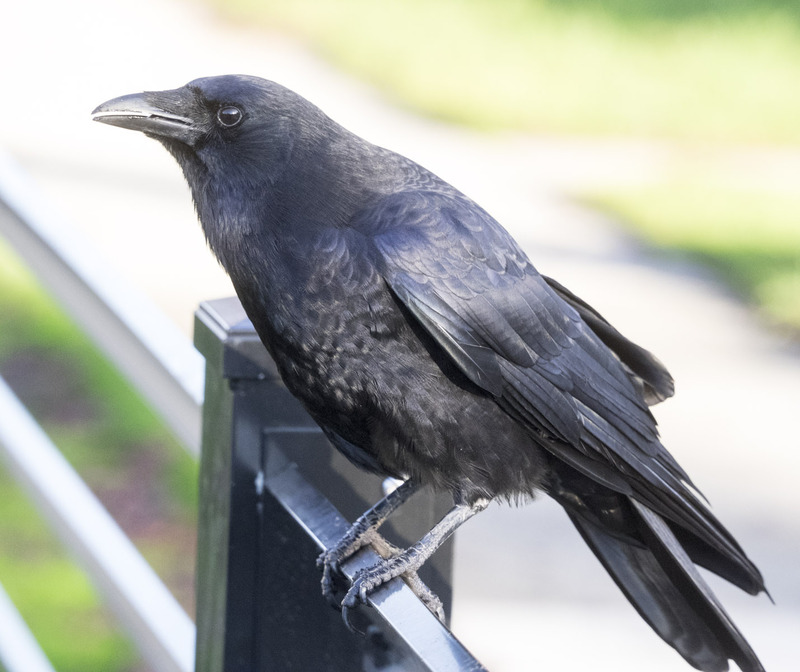 You can see portraits of Eric and George and the other local crow characters on my web site in the Crow Portrait series. The current gallery is about to be retired (on Oct 31) and replaced with a new series. 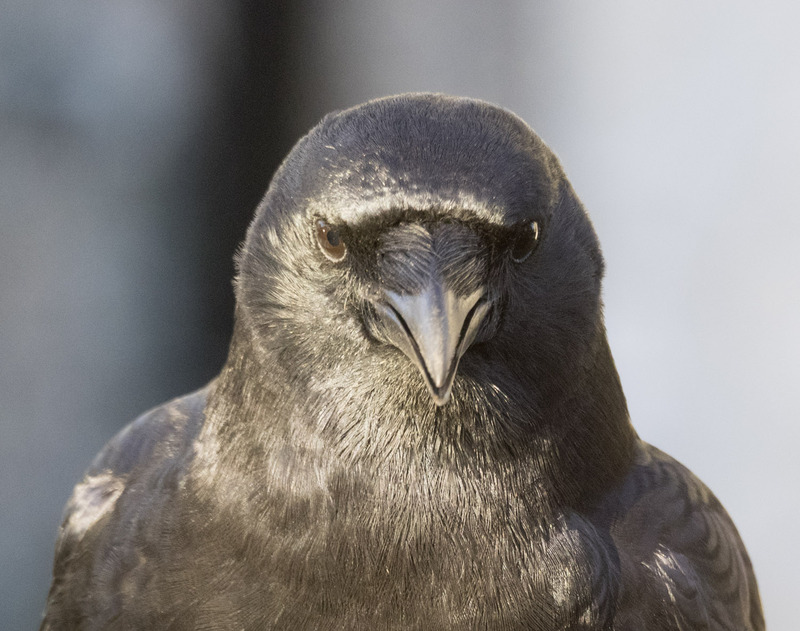 My City Crow calendar features all pictures of Eric and his family, taken in 2014 and 2015. Happy autumn. Remember to get out and take a walk. You never know what (or who) you might see. Great post!!!! I’m so glad Eric followed you home, I didn’t want him to be fickle! Love reading your adventures. I just heard an eagle calling so have my camera ready for when he takes off. Aren’t we lucky to have such action in our neighbourhoods. 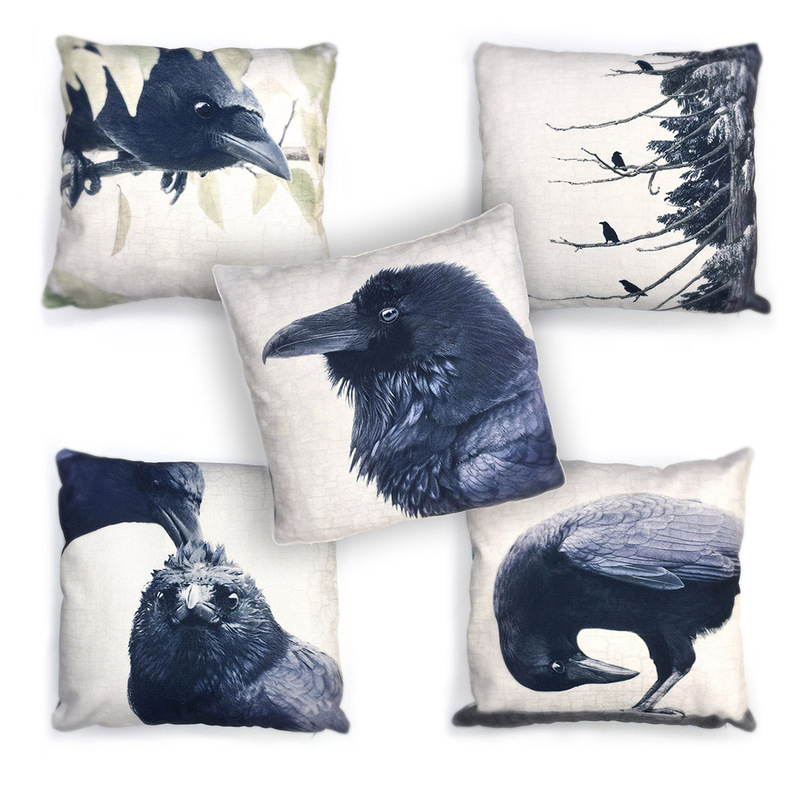 Being another Crazy Crow Lady, I so enjoy these blogs. Does George swoop down low when you near your home? The crows that hang around here (how on earth do you tell them apart?) swoop really low over me as I get close to my door. Then they are waiting on the fence at the back for me. Hi Michèle – George is pretty much always waiting. Or if he isn’t, the less bold family members let him know I’m out and about so he can come and see if I have any peanuts for him. Hard to tell them apart when they’re flying around. I can tell George by the way he is the boldest, puffs his feathers out so he looks bigger and the other crows defer to him. 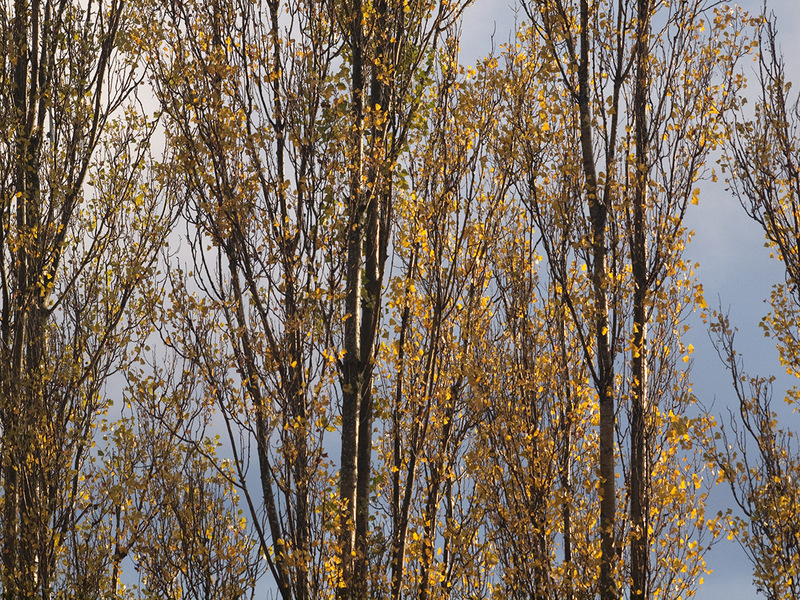 Mavis and I need your help to try and save the Notre Dame poplar trees where she and Marvin (and many other birds) nest each spring. These locally important trees are still in danger of removal once this spring’s nesting season is over. Instead of an arborist report the school has presented a “Tree Risk Assessment” to the City in support of their plan to install a sunken, artificial turf football field with concrete retaining walls and bleachers. In the “Assessment” the obvious is stated: if the project goes ahead and half of the trees’ roots are dug out they will become “high risk.” The previous arborist report said that they could be saved if the excavation were set back 5.5 metres. We are running out of time to make a difference. The City Planning Department has set April 19 as the deadline to receive comments on the Notre Dame project. As April 19 is Good Friday, we really only have until THURSDAY, April 18. Local residents have signed a paper petition that we will hand in at City Hall this week. 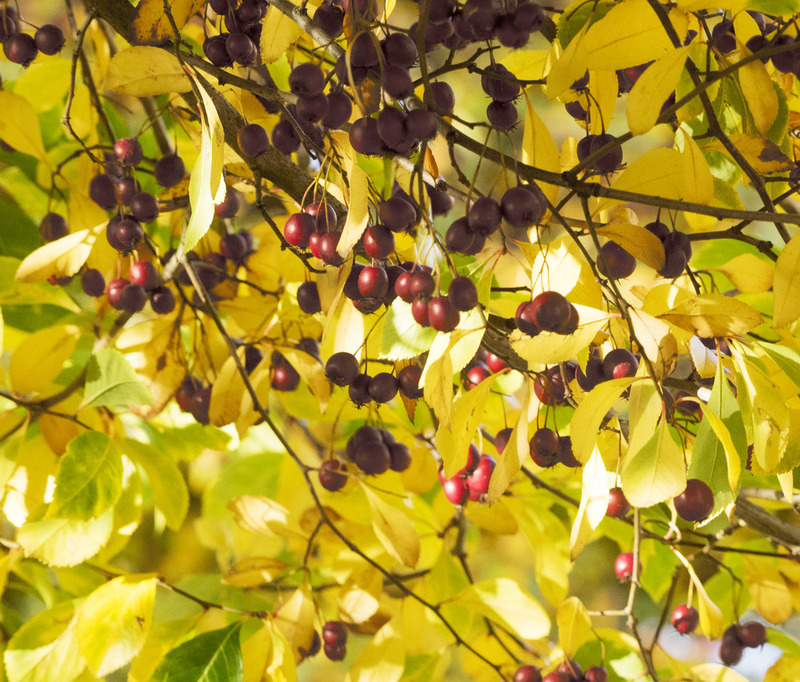 But, even if you don’t live locally, you can speak out on behalf of these beautiful trees. All we ask is that they be given a fair and unbiased assessment instead of the report based only on what will happen if the roots are fatally compromised. As you know from my many images of these trees (check out #notredamepoplars) they are beautiful in all seasons. They also provide habitat for many kinds of birds, bugs and animals, and are the only green space for miles around in an urban area sorely lacking in natural landscaping. If you click on my bio link you will see a button at the top called HELP SAVE THE NOTRE DAME POPLARS. Click on this for links to contact Vancouver City Hall and Planning Department, and some questions you can ask. If you could do this before Friday, Mavis, Marvin, countless other birds, the napping raccoons and I would be ever so grateful. Nerve wracking drama, tense power struggles, a compelling cast of characters ... Game of Nests has got it all! Check out the latest post at urbannature.blog!